Places are filling fast in the 45 professional development workshops offered at the American Evaluation Association conference in Minneapolis, Minnesota. Many of the workshops are so popular they are run annually, but every year we see some new entries that are well worth hearing about. This is a new offering designed for evaluators who work with vulnerable populations in developed or developing countries. The approach and methods focus on “whose reality counts” – capturing community and participant values to help define what a “valuable outcome” or a “good solution” would look like in their reality. As you’ll hear in the interview, the three facilitators bring with them a wealth of experience working with vulnerable populations, in a total of 55 countries! More information about the workshop will soon be available via Tererai’s Tinogona “It is achievable” website, and on her Tinogona Facebook page. Don’t forget you can subscribe to our Genuine Evaluation iTunes podcast feed and capture all of our interviews – the perfect way to stimulate your evaluative mind as you while away time traveling, commuting, taking a break from that report, or getting some exercise! 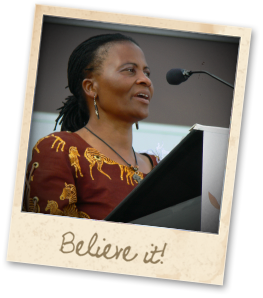 Some of our long-time readers may recall that Tererai Trent was a guest blogger on Genuine Evaluation in September 2010, and it is hard to imagine a more amazing journey to become an evaluator and international public speaker than her story. From humble beginnings in a cattle-herding family in rural Zimbabwe, where she was denied education because she was a girl and taught herself to read, Tererai has overcome incredible odds to achieve her dreams. With her mother’s encouragement to aim high, Tererai wrote down her life goals on a scrap of paper and buried them in a tin box beneath a rock in a field where she herded cattle. Then she began systematically crossing those goals off as she achieved them. From her poor village in Zimbabwe, Tererai left for America in the late 1990s and earned her bachelor’s and master’s degrees in 2000 and 2003 from Oklahoma State University. In 2009 she checked the last item off her list when she was awarded her doctorate – an Interdisciplinary Ph.D. in Evaluation from Western Michigan University. 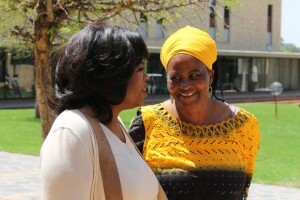 We are pretty sure Tererai is the world’s first evaluator to appear on the Oprah Winfrey Show. Make absolutely sure you check out her amazing story on the Oprah site in video form. It’s incredible. Standard registration rates for the AEA conference and workshops are available until October 11th (at US$160 for a 1-day workshop, it’s a bargain!). For those unable to attend, please post a comment under the post on the Genuine Evaluation site if you’d like to see a webinar or other distance learning opportunity from Tererai, Mary, and Kerry! Hi — I too would love to see a webinar on this topic. I’ve already booked my AEA workshops so unfortunately won’t be able to attend. This sounds fantastic. Thanks!